A long-awaited survey of the life and times of a cultural icon. Given Joan Baez’s centrality to American cultural and political life over the past five decades, the greatest surprise about this documentary is that it wasn’t made much sooner. While Bob Dylan’s career has been the subject of a multitude of docs and bios, essays and retrospectives, Baez’s work -- both as artist and activist -- has received comparably little scrutiny or contextualization. While her classic Vanguard albums have been carefully and conscientiously re-issued and re-mastered (and supplemented by comprehensive liner notes by Arthur Levy), it’s still been over 20 years since the publication of Baez’s autobiography, And A Voice To Sing With (1987), and that book is not widely available now. This lack of attention means that Baez -- despite her continued vibrancy as a live performer, her ongoing campaigning work and the overall excellence of her recent recorded output -- has arguably risked being fixed in the popular imagination as a worthy but dull crusader. A '60s icon, to be sure, but also, to some extent, a footnote in Dylan’s life-story, an emblem of the “protest” stage that he had to transcend before going on to create his most dynamic and experimental music. For those hoping for a more idiosyncratic I’m Not There-ish take on Baez, How Sweet the Sound is not the place to come. But it’s a clear, well-made and thoroughly enjoyable documentary, respectful in tone, but rarely hagiographic. Baez’s characteristic wry humour and sly self-mockery deflect such a response. Musing with wit and candor on the shock of her early fame, her musical heritage, and her politics, Baez is great company -- not to mention a living, breathing witness to some of the most important events in 20th Century culture and politics. The archive footage that Spector and Wharton have amassed to illustrate her recollections is superb, and encompasses family home movies and footage of wider political significance, showing Baez in the thick of Civil Rights and draft-resistance protest, and capturing her visit to North Vietnam, where she is seen praying with the residents of Hanoi during the heaviest bombardment of the war. Baez states frankly that her political activities sometimes took precedence over her music and her personal life. Her conversation with her ex-husband David Harris -- two '60s warriors surveying their “tumultuous times” as “Mr. and Mrs. Peace In America” with perspective and good humour -- addresses some of these issues in a particularly engrossing way. Dylan’s contribution is similarly affectionate; he speaks with palpable warmth about his early collaborations with “Joanie”, and offers his take on the 1965 British tour -- described by Baez here as a “hideous” experience. Superb footage of the pair gleefully duetting on "I Pity The Poor Immigrant" (from the Rolling Thunder Review tour in the mid-'70s) captures the dynamism of their renewed rapport. In a life-story as rich as Baez’s, some elements, inevitably, get merely sketched in in the documentary. Baez’s family background could have been examined in more depth, while the coverage of her campaigning activities in the 1980s and '90s becomes a whistle-stop tour of war zones. Condensing her wide-ranging work onto one CD must have been similarly challenging, but the 15 songs selected (mostly live or rare performances) do a pretty good job of showcasing Baez’s gift for inhabiting songs both ancient and contemporary, and also highlight some of her rare forays into original composition. It’s moving to hear Baez’s voice deepen and develop from its early stark power to its now richer, womanly present-day tone. 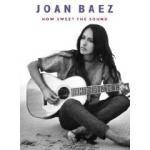 As CD and film, what Joan Baez: How Sweet the Sound conveys, finally, is the interrelatedness of Baez’s activism and her artistry, and her inspiring commitment to music as a bridge to others, a means to integration and understanding. As the song advises: “Carry it on”.